Each year, between 8,000 and 9,000 people nationwide complain to the government about nursing home evictions, according to federal data. That makes evictions the leading category of all nursing home complaints. Sara Anderson and her father, Bruce Anderson, in 2015. 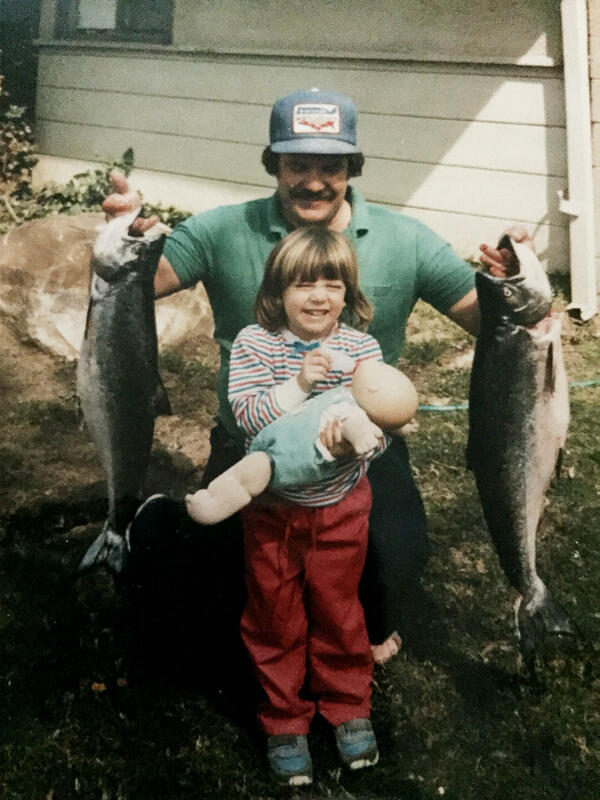 Sara and her father around 1985. What if you had to go to the hospital, and when it came time to return home, your landlord said you couldn't move back in? Across the country, thousands of nursing home residents face that situation every year. In most cases, it's a violation of federal regulations. But those rules are rarely enforced by the states. So, in California, some nursing home residents are suing the state, hoping to force it to take action. One of the plaintiffs is Bruce Anderson. Currently, he lives in a hospital room at Sutter Medical Center in Sacramento. He's been there since May 28, 2015. That's when his former nursing home sent him to be treated for pneumonia. When he was cured, the nursing home refused to readmit him. The hospital hasn't yet found him another nursing home to go to. So the hospital room has been his home for 260 days. The cost to Medicaid to keep him there is about 2.5 times what his nursing home cost. Bruce Anderson has a severe brain injury. It happened 11 years ago, when he had a heart attack and went without oxygen for several minutes. He was just 55 years old, and has lived in nursing homes ever since. When his daughter Sara Anderson comes to visit, she asks what he did all day. He replies in a gravelly voice: "Nothing." At the nursing home, Sara explains, there were activities for her dad. Bingo was a favorite. And the family could take him on outings. But in the hospital, Anderson can't simply come and go as he pleases, so he has just been sitting in his bed for the past nine months. He has good days and bad days, says his sister, Sonja Bentley, who visits along with Sara. This is one of the good days, Sonja says. Sara agrees: "He knew my name." And that's rare, since Bruce Anderson usually thinks he's still in his 30s. Back then, Sara was only a baby. When she and Sonja visit now, they reminisce with him about his glory days, when he was a hunter, a fisherman and a well-known prankster in his small Central Valley town. Everybody remembers him, says Sara. "Every single one of them goes, 'Oh, Bruce! He tried to drive a jeep up a tree once.' Or they all have some story about him," Sara says. "He was a legend." Anderson is still a hell-raiser, but not in a good way, according to his former nursing home, Norwood Pines Alzheimer's Care Center. The home's legal representatives wouldn't comment. But in a recent court document they say that Anderson was combative, a danger to the staff and other residents. That would have been a legal reason to discharge him. Yet Norwood Pines never tried to do that in the nearly four years Anderson lived there. So Sara Anderson was shocked when Norwood Pines wouldn't take him back. She appealed to the California Department of Health Care Services, which oversees Medicaid. The department held a hearing, and she won. Norwood Pines was ordered to readmit her father. The nursing home still refused. That's no surprise to Tony Chicotel, a staff attorney with California Advocates for Nursing Home Reform. "We have lots of cases where the state has found that it's appropriate for the residents to return, but then they don't do anything afterward," says Chicotel. That's why his organization has joined with Bruce Anderson and two other nursing home residents in suing the state of California. They want a federal judge to make the state enforce its own rulings. One reason that doesn't happen, says Chicotel, is that the department in charge of the appeal hearings for such evictions, the Department of Health Care Services, has nothing to do with disciplining nursing homes. That's the job of the Department of Public Health. "It's easy to describe this situation as a Catch-22," says Chicotel. "Each agency does its own thing, and they don't work together very well, and the residents fall through the hole. But at this point I think [the problem] is indifference." Chicotel says the residents most likely to be refused readmission fit a particular type. First, they're all on Medicaid, which pays nursing homes less than they get from Medicare or private insurance. Second, he says, these are patients who are behaviorally difficult to manage — for example, "residents with mental health issues or significantly advanced dementia, or maybe traumatic brain injury." They're undesirable, says Chicotel, "because they might take a disproportionate amount of labor time." In other words, they're expensive to care for. Bruce Anderson, for example, requires someone to watch over him 24/7. This is not just a California issue. Nationwide, between 8,000 and 9,000 people complain to the government about nursing home evictions every year. It's the leading category of all nursing home complaints, according to the federal Administration for Community Living. Robyn Grant thinks the problem is even larger than reported. Grant would know: She's the public policy director for the nonprofit National Consumer Voice for Quality Long-Term Care, so she hears about many nursing home evictions around the country like the ones in California. "A lot of individuals, residents and their families, if they're told, 'You have to find another home,' just accept what the people in authority tell them and don't think they have any choices," Grant says. "They may not know that they have rights to challenge that eviction." California officials wouldn't comment because of the lawsuit. But in their motion to dismiss it, they argue that nursing home residents already have plenty of options for defending their rights. Deborah Pacyna agrees. She's the director of public affairs for the California Association of Health Facilities, which represents nursing homes. Nursing home residents can complain to the Department of Public Health, says Pacyna. "The department can then investigate," she says. "They can impose daily fines, force the facility to put in a plan of correction. So, in our view, there are plenty of regulations on the books." But California's Department of Public Health rarely uses those rules. State records show that, on average, just 11 nursing homes are fined each year for wrongly discharging a resident. And the average fine is only around $2,000. Meanwhile, California taxpayers have paid well over $100,000 to keep Bruce Anderson in a hospital room that he tells his sister he can't wait to leave. "I know," Sonja says, trying to soothe him. "We're going to get you out of here. We are." Though when that might be — and where he'll go — no one in the family knows for sure. Just imagine this scenario for a moment. You have to spend some time in the hospital. You come home, and your landlord says you can't move back in. You're evicted. This is actually happening around the country to people who live in nursing homes. Government rules do not allow this in most cases, but those rules are rarely enforced. And now in California, some nursing home residents are suing the state to force it to act. NPR's Ina Jaffe reports. STEPHANIE WOODS: How are you doing, honey? Do you remember me, Stephanie? INA JAFFE, BYLINE: Nursing assistant Stephanie Woods gets along great with her patient, Bruce Anderson. WOODS: Well, I'm going to come back and see you before I go home tonight, OK? WOODS: Good seeing you, darling. JAFFE: Bruce Anderson seems to be popular with the staff here at the Sutter Medical Center in Sacramento. They even gave him a handmade blanket to brighten up his room, which is nice, because this hospital room is where he lives now. He was transferred here from his nursing home late last May, when he came down with pneumonia. When he was cured, the nursing home wouldn't take him back. The hospital hasn't yet found another nursing home for him, so he's been in this room for 260 days, with Medicaid paying the hospital about two and a half times what it costs to keep him in the nursing home. SARA ANDERSON: So what have you done today? B. ANDERSON: Just laid here. S. ANDERSON: Just laid there? JAFFE: That's Sara Anderson, Bruce's daughter. S. ANDERSON: Hey, you know what? I got an email from Charlie Fong. He said he came by and visited. Did you guys have a nice chat? S. ANDERSON: You did? What did you guys talk about? JAFFE: Bruce Anderson has a severe brain injury. It happened 11 years ago when he had a heart attack and went without oxygen for a few minutes. He was just 55 years old. He's lived in nursing homes ever since. 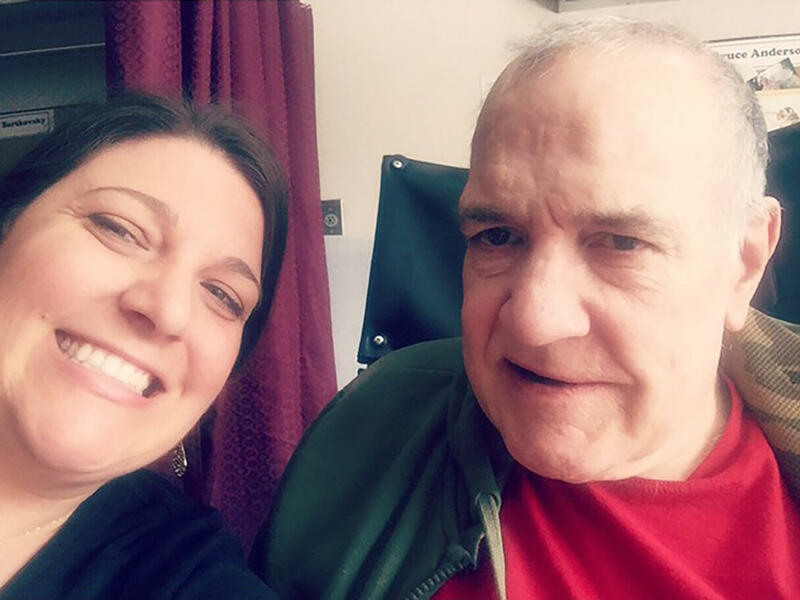 His daughter says that at the nursing homes, there were activities for her dad - bingo was a favorite - and the family could take him on outings. But when you're in a hospital, you can't just come and go as you please. So Anderson's just been sitting in his bed for the past nine months. There's not much stimulation, but his sister, Sonia Bentley, says this is one of his good days. SONIA BENTLEY: He's really alert today. S. ANDERSON: He knew my name. JAFFE: Which doesn't happen often, since Bruce Anderson usually thinks he's still in his early 30s, around the time his daughter was born. So Sara and Sonia reminisce with him about his glory days, when he was a hunter and a fisherman and a well-known prankster in his small Central Valley town. Everybody remembers him, says Sara. S. ANDERSON: ...Some story about him. He was a legend. JAFFE: Anderson is still a hell raiser, but not in a good way, according to his former nursing home, Norwood Pines Alzheimer's Care Center. The home's legal representatives wouldn't comment, but in a recent court document, they say that Bruce Anderson was combative - a danger to the staff and other residents. And that would have been a legal reason to discharge him. But Norwood Pines never tried to do that in the nearly four years Anderson lived there. So Sara Anderson was shocked when Norwood Pines wouldn't take him back. She appealed to the state. They held a hearing, and she won. Norwood Pines was ordered to readmit her father. They still refused. And that's how it usually goes, says Tony Chicotel of the California Advocates for Nursing Home Reform. TONY CHICOTEL: We have lots of cases where the state has found that it's appropriate for the residents to return, but then they don't do anything afterward. JAFFE: That's why his organization has joined with Bruce Anderson and two other nursing home residents in suing the state of California. They want a federal judge to make the state enforce its own rulings. One reason that doesn't happen, says Chicotel, is that the department that holds the hearings isn't allowed to sanction nursing homes. That's up to a completely different department. CHICOTEL: It's easy to describe the situation as a Catch-22. Each agency does its own thing, and they don't work together very well, and residents fall through the hole. But at this point, I think it's indifference. JAFFE: Chicotel says the residents most likely to be refused readmission fit a type. First, they're all on Medicaid, which pays the nursing homes less than they get from Medicare or private insurance. And second, they're difficult to manage. CHICOTEL: And that's going to be residents with mental health issues or significantly advanced dementia or maybe traumatic brain injury and are undesirable for that reason - because they might take a disproportionate amount of labor time. JAFFE: In other words, they're expensive to care for. Bruce Anderson, for example, requires someone to watch over him 24/7. Now, this is not just a California issue. Nationwide, between 8 and 9,000 people complain to the government about nursing home evictions every year. It's a leading category of all nursing home complaints, according to the Federal Administration for Community Living. ROBYN GRANT: I really think that the problem is much bigger than reported. JAFFE: That's Robyn Grant, the director of public policy for the nonprofit National Consumer Voice for Quality Long-term Care. She hears about nursing home evictions around the country similar to the ones in California. GRANT: A lot of individuals - residents and their families - if they're told, you have to find another home, just accept, you know, what the people in authority tell them and don't think that they have any choices. They may not know that they have rights to challenge that eviction. JAFFE: California officials wouldn't comment because of the lawsuit. But in their motion to dismiss it, they argued nursing home residents already have plenty of options for defending their rights. Deborah Pacyna agrees. She's the director of public affairs for the California Association of Health Facilities, which represents nursing homes. DEBORAH PACYNA: They can complain to the Department of Public Health. The department can then investigate. They can impose daily fines, force the facility to put in a plan of correction. So in our view, there are plenty of regulations on the books. JAFFE: But California's Department of Public Health rarely uses them. 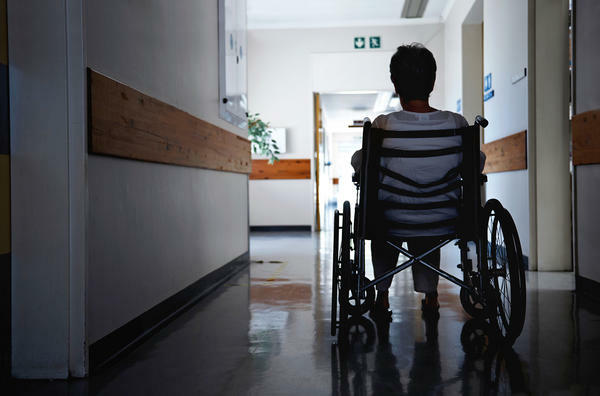 State records show that on average, just enough 11 nursing homes are fined each year for wrongly discharging a resident, and the average amount of the fines is around $2,000. BENTLEY: You want a Hershey's Kiss or a Reese's? JAFFE: Meanwhile, it's cost California taxpayers well $100,000 to keep Bruce Anderson in a hospital room he tells his sister he can't wait to leave. B. ANDERSON: I want to go home now. BENTLEY: I know. We're going to get you out of here. We are. JAFFE: Though when that might be, and where he'll go, no one in the family knows for sure. Ina Jaffe, NPR News. Transcript provided by NPR, Copyright NPR.